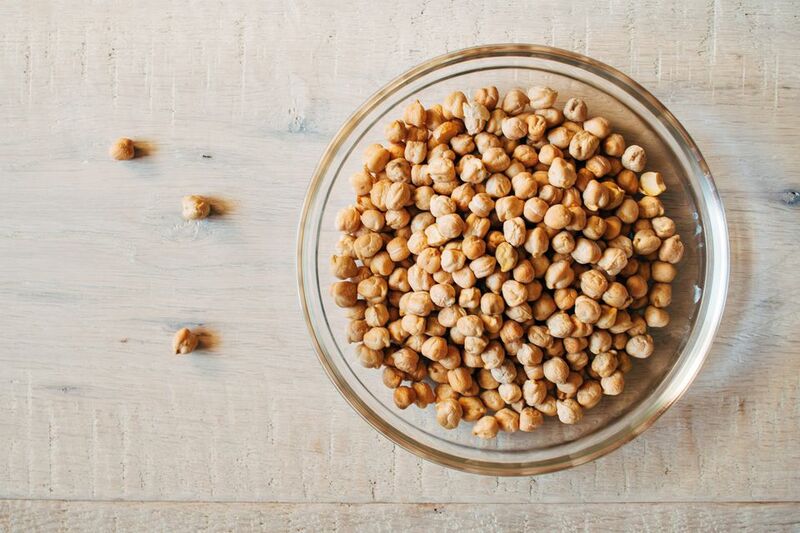 Chickpeas, also known as garbanzos, have been a staple in the Mediterranean Basin for hundreds of years. Though common throughout Italy, they're primarily grown in the south because they require high temperatures during the summer months. Once harvested, they're hung up to dry, and the seeds are then gathered and set aside. When you go to buy chickpeas you have several options. The easiest is to buy them precooked; Italian bakers often slip a pot full of chickpeas into the oven when they fire it up to bake bread and then sell them by the ladle, with some of their cooking liquid so the customer can reheat them at home. The next easiest option is to buy them canned; they're one of the few vegetables whose flavor isn't significantly harmed by the commercial canning process. The final option is to buy them dried and soak them. If you choose this tack, check the production date on the package, because chickpeas that are too old simply won't soften no matter how long they soak. Soaking times tend in any case to be long, on the order of 24 hours, and many people add a teaspoon of bicarbonate to the water to accelerate the process. I find that doing so gives the chickpeas rather unpleasant bitter overtones, and prefer to soak for the full 24 hours or more. Cooking times are also long, on the order of 1 1/2 to 3 or more hours, depending on the recipe; by the time they're done they will be soft and have a rather creamy texture. If you use a pressure cooker you can reduce the cooking times considerably, though you will have to experiment to see how quickly they cook in your cooker. It should come as no surprise, given these cooking times, that most chickpea recipes are winter dishes, ideal for those cold days when a pot simmering on the stove helps keep the kitchen warm. This would have been even truer in the past when people used wood-fired stoves or burners set into open hearths for cooking. From a nutritional standpoint, chickpeas are an excellent source of protein, proteins that are devoid of purines, and are therefore ideally suited to those who suffer from gout. With respect to other legumes they have a higher fat content, which makes them more caloric; they are therefore not what one wants during a diet. However, they are quite rich in calcium, making them a good choice for combating osteoporosis, are also rich in iron, and are an excellent source of fiber. They're instead sodium-poor, which makes them a good bet for those on reduced sodium diets. The easiest way to serve them? Heated, drizzled with a little extra-virgin olive oil and seasoned to taste with salt and pepper. If you serve them with tuna you'll have an excellent variation on tonno e fagioli; add a white wine and a tossed salad and you'll have nice simple lunch. Last thing: A number of recipes call for chickpea flour. It's easy to make: Lightly toast chickpeas by heating them in a skillet until they color lightly, shaking the skillet to move the chickpeas about and prevent burned spots. Next, whir them in a blender until they reach the consistency of flour. About Chickpeas, and getting them ready to cook. A Gibraltarian variation on Panissa, brought by Geneose sailors. Pasta with chickpeas, a variation on pasta e fagioli, from the Marche. Minestrone is a thick vegetable soup. This variation, from Sardinia, uses chickpeas. Stewed chickpeas make an excellent accompaniment to a roast or stew, will also work well at a picnic or barbecue. Hearty chick peas with greens and anchovies: perfect in winter! A tasty fish salad made with ray. Chickpeas and pork temple (actually pork meat from throughout the head) is a Milanese dish from the days of the Spanish occupation -- in the 1600s. Chick peas with greens, a vegetarian version of the more classic polpo (octopus) in zimino, from Clifford Wright. Looks tasty. La Festa di San Giuseppe NYC-Style -- a collection of Italian-American holiday dishes including two versions of Cavazune, cookies with a chick pea based filling, Sfingi, and more.